York hasn't lost in over a year. Gray-New Gloucester wasn't about to change that, as the Wildcats dominated the Lady Patriots in a 55-14 win. York started off its run to a second-straight state title with a dominating first quarter against the over-matched Lady Patriots. The Wildcats led 10-2 eight minutes in as Nicole Taylor and Steph Gallagher each had 4 points. The second quarter didn't get any better for GNG as 6 different York players scored. Alicia Valente hit a 3-pointer to give GNG its first field goal of the game, but they could only muster a Rachel Edson free throw to go with it. 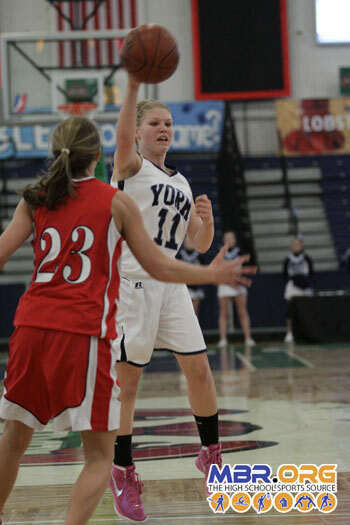 York's full-court press stopped GNG in its tracks, and the defending state champs went into the break up 29-6. It was more of the same in the second half. Andrea Mumford would score 5 straight points for York as they kept pulling away. Maggie Chaplin would score GNG's first 2-pointer with just over minutes to go in the 3rd, but the Lady patriots small victories were overshadowed by its many defeats. 8 points from Taylor in the quarter would make sure GNG didn't make any kind of a dramatic comeback. The fourth quarter was only a formality and York's reserves got some valuable playing time as the Wildcats eased into the finish line with a 55-14 trouncing. Taylor was named the Eli's Soda Player of the Game after scoring 17 points, and proving she was the best player on the court. York will now face Greely in the Semifinals as the tournament shifts to the Cumberland County Civic Center.